Demolition was probably my favorite tag team when I was a child. It began with their awesome looking black leather outfit with spikes all over it that even included a sinister looking mask. To top it all off, when they took their masks off, they had awesome looking face paint! Meanwhile, on the other side of this feud were two monsters for wrestlers: The Barbarian and The Warlord who made up the team of the Powers of Pain. The Powers of Pain made their WWF debut in June of 1988 where they would repeatable wrestle against Demolition in untelevised house shows. For the next several months, the teams would trade victories; with most of them coming by countout or disqualification. Several times, in the early months of this feud, the Powers of Pain were able to defeat Demolition in non-title matches. The feud began to heat up at that years Survivor Series in a ten-man tag team elimination match. At this time, Demolition were considered the heels as they were aligned with the devious Mr. Fuji. During the match, Mr. Fuji decided that he thought his team could not beat the Powers of Pain and he pulled the rope causing Smash to fall through the ropes outside of the ring. Smash ended up getting counted out, eliminating Demolition from the match. Ax confronted Mr. Fuji about it, and as he turned his back to check on his teammate Smash; Mr. Fuji took this opportunity to strike Ax with his cane on the back. If Demolition wasn’t already done with Mr. Fuji for pulling the ropes and causing their elimination, the strike with the can certainly did. Demolition took out Mr. Fuji and left him lying on the outside of the ring before returning backstage. Moments later, the Powers of Pain went over and checked on Mr. Fuji; the heel-babyface switch was complete. In a neat piece of history, on an episode of Superstars of Wrestling that aired in December but was taped prior to Survivor Series, there was an untelevised segment of the Brother Love show. During the show, Brother Love challenged Demolition stating that they couldn’t win a match without their, then manager, Mr. Fuji at ringside. This was how the match was taped where Demolition would wrestle without their manager but not give away the reason for Mr. Fuji’s absence to the fans in the live audience. On the episode of Superstars of Wrestling that aired on TV, this was simply left out and it appeared that Demolition had moved on without Mr. Fuji after the Survivor Series fiasco. Well thought out from the WWF creative team handling taped matches for their TV shows. Following Survivor Series, the teams once again wrestled in many house shows where several were locally televised. Below is one of their matches that ended in a double disqualification after Mr. Fuji and his cane got involved. In February of 1989 on an episode of Prime Time, the WWF Tag Team Champions defeated the Powers of Pain by disqualification when Mr. Fuji threw powder into Ax’ eyes after Ax had used Mr. Fuji’s cane behind the referee’s back attacking the Powers of Pain with it. After many of Demolition and the Powers of Pain’s matches ending with involvement from Mr. Fuji, it was decided that at Wrestlemania V, Mr. Fuji would not just be at ringside, but be in the match in a 3 on 2 handicap match for the WWF Tag Team Championships. As I mentioned at the beginning of this article, Demolition would finally get revenge on Mr. Fuji securing the victory after hitting their finisher – The Demolition Decapitation. While I was excited for Demolition to get the big win, these two teams wouldn’t wrestle again for the championship. It feels like a let down in this feud, unlike the great feud between The Hart Foundation and The British Bulldogs where there was a change of titles and what appeared to be another change of titles in revenge, that this rivalry could have gone on a little longer with more than just disqualification victories. Later that year in the 1989 Survivor Series, the Powers of Pain got a little revenge against Demolition when each member was able to eliminate a member of Demolition. Shortly after this, in early 1990, the Powers of Pain would cease to be a team after Bobby “The Brain” Heenan sold the Warlord’s contract to Slick leaving the two members in different manager stables. Demolition vs Powers Of Pain was essentially a continuation of Demolition versus Strike Force. Ax and Smash had used Fuji’s cane to defeat Rick and Tito at Wrestlemania 4 and Strike Force were looking for revenge, not only in terms of regaining the belts but also destroying Demolition as “punishment” for the “theft” of the belts. However it was Demolition who destroyed Strike Force by injuring Martel during a title defence, and so with one of the team incapacitated, Strike Force were forced to change tack in their crusade against Demolition. Tito Santana brought in the Powers Of Pain (formerly the Road Warriors’ evil opposites in Jim Crockett Promotions) as sinister pro-babyface mercenaries to exact a terrible revenge on Demolition for both the title loss and the injury to Martel, by taking the belts and destroying Demolition. Santana withdrew from all Strike Force’s remaining return title matches against Demolition and nominated the Powers as substitutes for himself and Martel. The Powers were the first team Demolition had ever faced that had an advantage in size and strength over Demolition. This negated Fuji’s usual strategy for Demolition to overwhelm opponents with superior power and brutality. The Powers defeated Demolition by pinfall in non title matches and by countout in title matches and for a time seemed to be likely to win the belts at any point. somehow, however, Demolition held out until the remaining Strike Force defence schedule had been exhausted and were able to return to a diet of smaller less powerful challengers such as the British Bulldogs, the Hart Foundation and the Rockers, while the Powers, having run out of title shots, were relegated to feuding with the Bolsheviks. However, Demolition and Fuji were still haunted by the on e team that had been able to give them a taste of their own medecine and at Survivor Series the two teams were opposing captains in the tag team event. By this time, the Powers were the last remaining babyface team (other than newcomers the Bushwhackers) whose challenge Demolition had not yet soundly turned back and it was clear that they were once again in line for title shots. 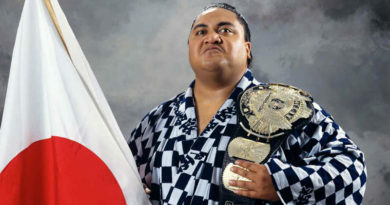 After his Survivor Series double cross, Fuji would claim that Demolition were being insubordinate by this time, but it was also suspected that he may have written Ax and Smash off as a lost cause. The Powers, for their part, needed to antagonise Demolition into a feud lest the champions try to duck them as contenders. Also, as suggested by Pro Wrestling Illustrated, they wanted to get back to being heels and needed to manipulate Demolition into turning babyface to avoid the WWF’s taboo on heel vs heel matches. Since Fuji was the fan hatred anchor for the otherwise cool-heel popular Ax and Smash, luring him over to their side was the ideal way to both antagonise the Demos into facing the Powers and also double turning the two teams. So it was at Survivor Series, with Ax and Smash having put up a particularly courageous performace against the Powers and being about to defeat them, that Fuji pulled down a ring rope causing Smash to be counted out and then got into a verbal confrontation with Ax before hitting him with his cane. Demolition then double teamed their now ex-manager and left him laying at ringside to cheers. Moments later the Powers broke off from wrestling last remaining opponents the masked Conquistadors and came down to Fuji at ringside, picked him up, dusted him off and guided him round to their corner where he in turn tripped a Conquistador with his cane for the winning pinfall. Although fans had booed when the Powers went to help Fuji, they forget themselves and cheered when the Powers got the pinfall win and their perky babyface music played – and then reacted with grunts of confusion when an angry Ax and Smash came down to the ring to seek revenge, slamming and clotheslining the Powers and for the first time showing real giant killing dominance over the Powers. As noted, after the match Fuji denounced Deomolition as disrespectful and disobedient while Demolition in turn labelled Fuji a parasite – “Fuj The Stooge”. Lest any doubters think that Fuji was now a babyface, two nights later he taunted young babyface Paul Roma into dropkicking him, thus bringing on a brutal beatdown of Roma by the Powers and ensuring that later in the night, Demolitions existing cool-heel popularity was converted into offifially sanctioned fan favourite status. Now with all the fans behind them and a new fearless philosophy, positively relishing the challenge of downing larger opponents, Demolition gained the upper hand in the feud, often being on the verge of a succesful pinfall victory over the Powers who had to be rescued and kept “strong” by Fuji and his cane. Eventually after Fuji’s salt throwing antics at the Main Event in February 1989, the Demos insisted that their former manager don the tights and become a full participant in a five man tag match for the belts at Wrestlemania V. The blowoff saw both Powers incapacitated at ringside while Fuji was “Decapitated” and pinned by his fomer proteges who remained champions. Demolition’s victory was further sweetened by their title reigh that same day exceeding the valiant Brothers’ one year and six days in length to make them the longest reigning WWF Tag Team Champions. (Meanwhile over in WCW that same day, the team they were accused of ripping off, the Road Warriors, lost their own World Tag Team belts, clearing the way for Demolition to finally achieve the number 1 slot in Pro Wrestling Illustrated’s tag team ratings.) 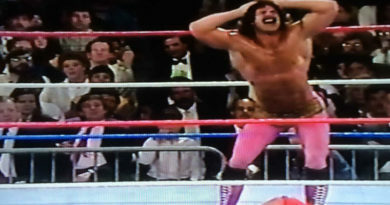 Just two matches after seeing Demolition – cheered by the fans – gain final victory over the mercenaries he and Tito had brought in to avenge his title loss and injury, Rick Martel turned heel on Tito Santana, later aligning himself with Slick, manager of Demolition’s next challengers, the even bigger and badder Twin Towers. However, Martel kept out of this feud and afterwards only ever met Demolition in one house show six man tag where the Demos and Tito beat Rick and the Rougeaus. There was a postscript at Survivor Series ’89 when each of the Powers pinned each of the Demos, but the subsequent series of matches again saw the Powers regularly having to be rescued from utter defeat by Mr Fuji and his cane causing a DQ. In the end, Fuji split up the Powers and sold them each to Slick and Bobby Heenan to concentrate on his new team, the Orient Express. Eventually, he would reconcile with Ax, Smash and Crush after their reversion to heels and become the manager of Smash and Crush during their final months as a team. Wow that’s fascinating I never knew they were brought in by Tito, do you happen to know if this happened on a Superstars of Wrestling or another WWF TV programming? Not sure if it was ever on TV – if there’s any TV footage of Tito with the Powers, it will be on local stations’ showings of full length arena cards (which, mind you, were a common source of footage for Superstars/Challenge) but definitely see if you can get hold of the November 1988 Pro Wrestling Illustrated with the story “Warlord And Barbarian – Demolition’s Nightmare” which contains quite a lot of info on the Strike Force- Powers connection. At the time, as a Demolition fan, it made for depressing reading; in retrospect since the Demos won the feud and went on to be longest reigning champs, we can afford to sit back and laugh at how wrong PWI was on the prediction that the Powers would storm to the belts. Also in the same issue, Craig Peters in his In Focus column has a “Demolition Premonition” where he predicted the Demos would drop the belts by the time the magazine hit the stands. 14 years later in 2002 on the Kayfabe Memories forum I had great fun winding Peters up about that one. The first recorded appearance of the Baron is at a Providence RI TV taping on Aug 23rd when they squash two jobbers. The only summer 88 heel Demo vs face Powers match on Youtube is from July 23 at the Philly Spectrum (as part of the full show and possibly as a lone bout) which ends with the Powers winning by CO after Barbarian gets back in the ring just before the count. No Tito in sight and the Demos put up a fiercer fight than the PWI article would indicate.